Morkul Gatekeeper is a common Strength creature card. It is part of the Core Set. 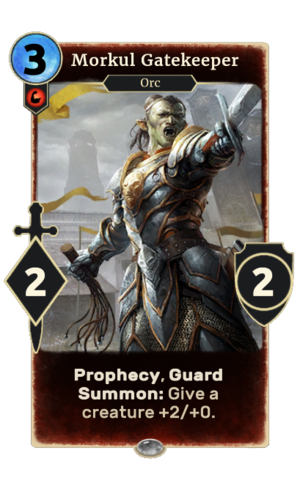 In addition to the card's availability in the Core Set, three copies are included in the Aela's Companions theme deck, and one copy in the Hlaalu Schemes theme deck. "Close ranks! Let nothing through!" "Hold them back, scorch-stump it!" "Let nothing through! Close ranks!" The card's summon ability applies the Lower the Gates card effect. An alternate-art version of the card was awarded to participants in the May 2018 Grand Melee. The card is named for the Morkul Stronghold, which appeared in ESO. The card is named "Orc Gatekeeper" in the audio files. This page was last modified on 24 February 2019, at 11:44.